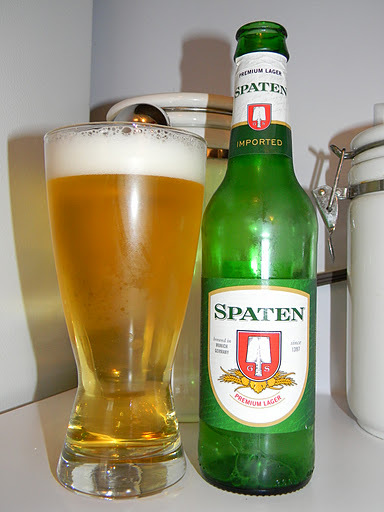 Review of Spaten Premium Lager | Beer Apprentice - Craft Beer News, Reviews, Interviews and Info. Hello guys. Sorry I’ve been away for a few days. I had to be out of town for work and couldn’t post any reviews, however I’m ready to get back to it. For today’s craft beer review I’m going to be sampling the Spaten Premium Lager produced by Spaten-Franziskaner-Brau located in Munich, Germany. I’ve never had this particular brew before, so let’s get to the website, spatenusa.com, and find out a little bit about it. This beer is our speciality. In 1894 Spaten became the first brewery in Munich to produce this brand of light lager. Golden in color with a well-balanced hop-flavor. The full rounded body is a superb balance between hops and malty sweetness. How ’bout we give it a pour? This brew has an ABV of 5.2% and it comes in a 12 oz. green bottle. The beer poured a very clear, straw yellow color. The head was bright white and soapy. It was only average in size and the retention time was only average also, but the lacing left behind looked very nice. I noticed lots of bubbles rising to the top from the bottom, which let me know the carbonation was fairly lively. The aroma started with a heavy grain bill. Hints of crackers and white bread along with touches of ripe green apples and white grapes. A trace of grassy hops were noticed. They seemed very clean and fresh. Not too bad on the aroma with this one. Fairly straight forward, however evenly balanced and fitting. The taste brought out more of the grain. I noticed savors of white bread and unsalted crackers. It was very crisp and fresh with a slight bit of toastiness. I discerned a touch more of the green apple, however I also noticed a slight lemon sweetness. The hops were restrained and only the most mild bitterness was recognized. Again, nicely balanced and proper though. The mouthfeel was medium bodied, smooth, crisp, dry and snappy. This brew was very thirst quenching and refreshing. The carbonation was good and the flavors hung around for a second then they vanished rather quickly, which persuaded me to take another huge gulp. This is a great “yard work” beer. Very easy drinking and with plenty of flavor to keep me interested for the duration. I could easily put a few of these back on a warm day without even thinking about it. This brew is not too complicated nor pretentious, but rather a good, easy going beer that could be enjoyed by any level of craft beer enthusiast. I think it’s worth a try, especially if you are looking for a fun, enjoyable drink to share with others. Thanks for checking in today guys. I really appreciate it. Also, I should now be back to posting reviews on a daily basis for awhile. Again, I apologize for having to skip a few days. Feel free to leave a comment if you wish.